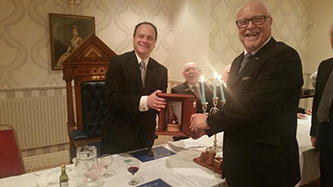 The idea of a Travelling Gavel is not new, but what a lovely and inspiring way to encourage Masons across the Province to visit one another, not only to witness how other Lodges perform their ritual, meet new friends and renew old acquaintances and enjoy the Festive Board, but also to mount a devious and well thought-out rescue plan on a new treasure – the Travelling Gavel. So here is a good reason to get out and about, from one end of the Province to the other. Unlike the Travelling Gavel in a neighbouring Province, which only travels in a very small area, ours can travel much further – it even has its own Passport. Good luck in your rescue attempts but please read and abide by the Rules. The idea was conceived by W. Bro. Fisher; the Gavel was presented by W. Bro. 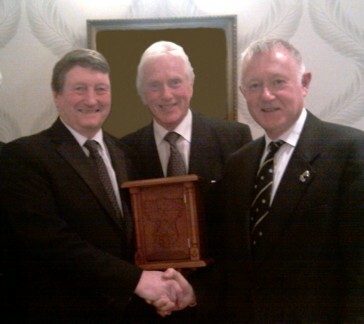 Coates and the box made and presented by W. Bro. Wiles. 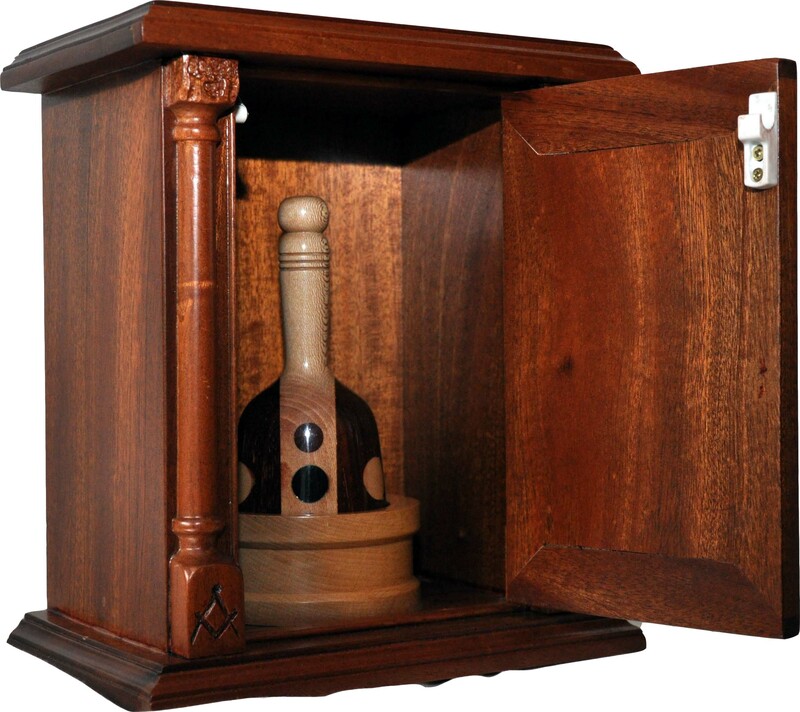 On Tuesday 14th June 2011, Humber Lodge No 57, saw the launch of the Travelling Gavel when visitors from several lodges, and three masonic provinces attended the meeting. The Worship Master, Bro. Alan Jackson and three brethren attended from Londesborough Lodge No. 734 and demanded the Travelling Gavel. Four brethren from Ridings Tablers' Lodge No. 9586 were also in attendance and likewise demanded its surrender. As the members of the Londesborough Lodge No. 734 had travelled the furthest distance, W. Bro. David Terry declared that the gavel had been rescued by that lodge. We hope that other lodges in the area are able to rescue the travelling gavel in the near future. This photo shows Bro. Alan Jackson, Worshipful Master of Londesborough Lodge No. 734, rescuing the 'Travelling Gavel' from Bro. David Terry, Worshipful Master of the Humber Lodge No. 57 and W. Bro. Terry Fisher, who initiated the idea. Tuesday 5th July was an extremely warm night at the Londesborough Lodge in Bridlington. The warmth of the evening was more than matched by the warmth of the welcome to the Assistant Provicial Grand Master William Fisher and his team and a large contingent of visitors. W Bro William Henry Fisher PJGD presented a certificate of 50yr in Freemasonry to W Bro Edward Gordon Taylor PPJGW. There followed an interesting talk about the masonic laying of the foundation stone of Bridlington School, given in the Lodge room. The brethren then ate a hearty meal in the dining room downstairs. Bro. David Terry, WM Humber Lodge No. 57 was in attendance with six Humber brethren, and was delighted to respond on behalf of the visitors. The festive board proceedings were enhanced when several claims were made for the travelling gavel but Minerva Lodge, the Ridings Tablers Lodge and others graciously conceded to the superior numbers of Royal Lodge 643 which boasted eight members in attendance. The Royal WM W Bro Fred Harrison PGStB received the peripatetic artefact from W Bro Alan Jackson, promising to keep it safe until the next meeting of his Lodge in Filey on Tuesday 20th September. 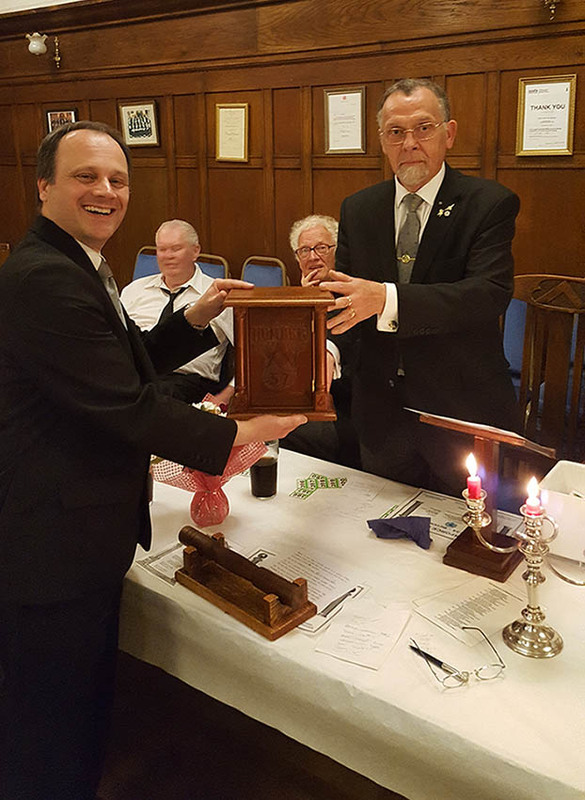 The Travelling Gavel has been rescued once again but on this occasion, it has not travelled too far, in fact it has remained in the same masonic building in Filey. 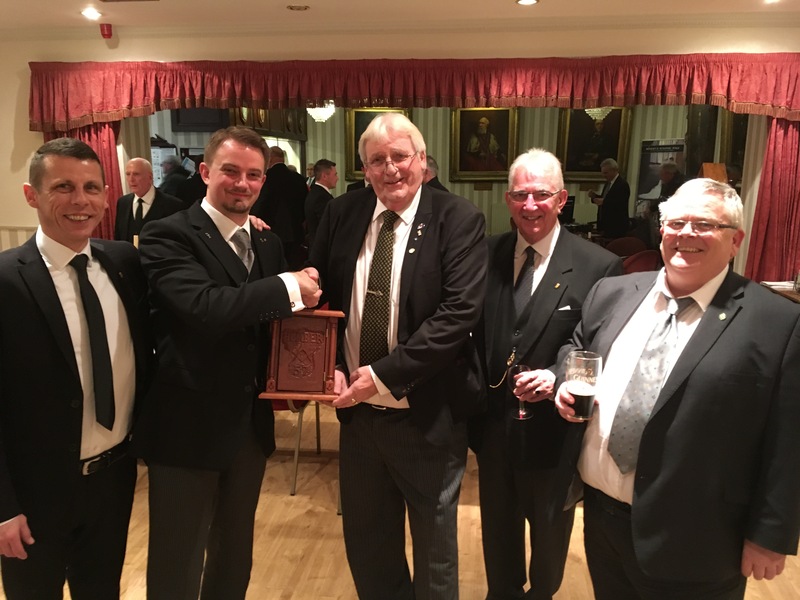 On Tuesday 20th September, Portus Felix Lodge 6712 raided the Royal meeting and seized the prize. It is understood that this was an harmonious rescue and a good time was had by all. It seems that Portus Felix have put on a long and brave fight to hang on to the Gavel, but after a seige lasting well into the night, followers of Tim Haley, W.M. 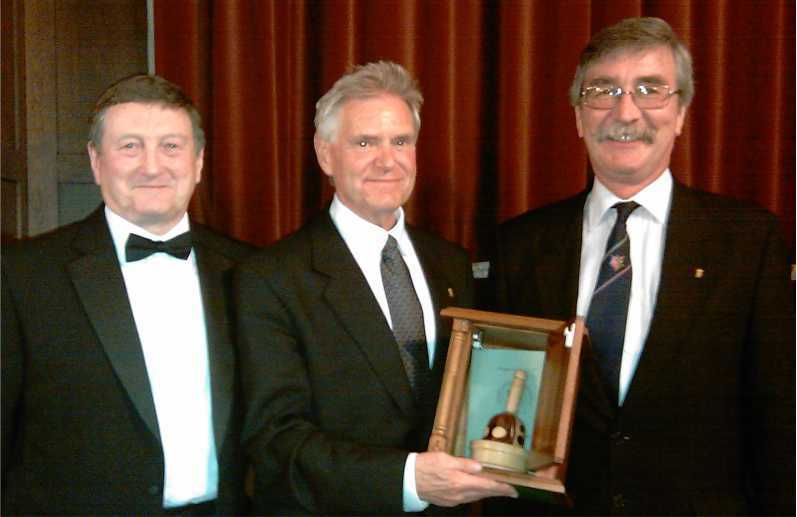 Wyke Millenuim Lodge braved the wilds of the North Yorkshire and came away with the prize. Well done Portus Felix for hanging in there for so long, and congratulations to Wyke Millennium on rescuing the artifact! Well, I no sooner added the name of Wyke Millennium to the Honours Board when Ridings Tablers' relieved them of the prize. That said, it was not a formality. The evening was the Installation of my very good friend, that brave heart, Barrie Jeffrey. 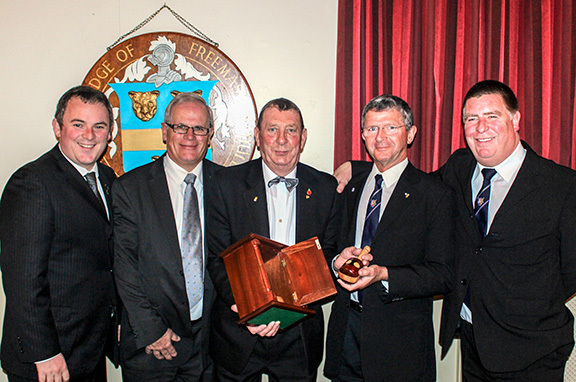 A splendid night which culminated in a free-for-all on which Lodge was to carry the Gavel home. Several competing Lodges tried their hand. Humber claimed victory by having four members. Technical claimed the prize with six members. Ridings Tablers' then overwhelmed the Festive Board by fielding no fewer than twelve members. Not to be outdone, Humber Installed Masters then claimed they should be handed the prize after fourteen of their most fearsome members stood up. Poor Bro. Jeffrey did not know what to do or whom to award the Gavel. In the end, he decided that Ridings Tablers’ should have the honour of rescuing the Gavel but it is hoped that they will not have it too long before a rescue mission is mounted. Over to you! Are you worthy of mounting a rescue? Well, after a leisurely sojourn at Filey, and a short stay with Wyke Millennium, I suspect that Ridings Tablers’ thought they would have the pleasure of the Gavels company for a short while. I suspect that even they did not think it would be that short though - less than a fortnight in fact because on Friday 25th May, they were visited by eleven rogues from St John of Bridlington who wrested the Gavel from the grasping hands of the Ridings Master, W. Bro. Hamilton, who had taken possession of it on the 12th from W. Bro. Jeffrey at his installation at Tickton Grange Hotel. The Humber brethren are pleased that it is getting around, but do not let St John of Bridlington have it too long – the Gavel may start to like to bracing sea air. 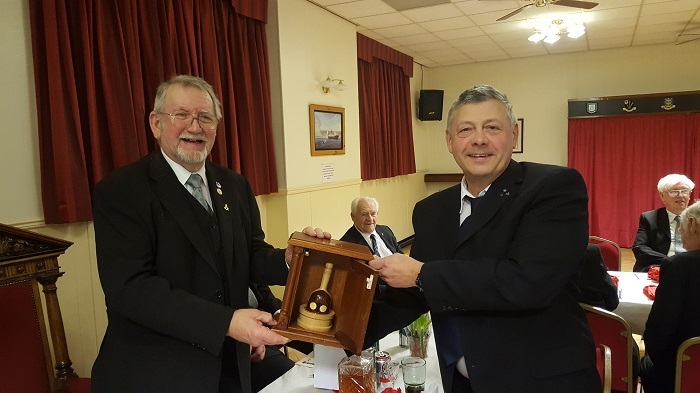 Londsborough 734 made a bid for the Gavel when 9 brethren raided the Festive Board of St John of Bridlington at their meeting on Thursday 6th September. Hopefully photos will follow but it is understood that a good time was had by all. Now brethren, the Gavel has languished at Brid' for far too long and needs to get a bit further afield, so come on, get a small raiding party together (at least 4) and storm the basions at Londsborough and rescue this worthy prize. Burlington Lodge 3975 are now guarding the Travelling Gavel from all-comers. Will no-one try and take it away from them? The Gavel has been on the coast for that long now that it has started to grow barnacles and a Capt’ Birdseye type beard. In addition, the Gavel has been travelling now for almost 18 months and has not managed to get further up Province than Filey. What's the matter with you northern brethren, are you frightened of us in the east? My man on the ground (sorry, not even Lord Levison could prise his name from my lips) assures me that even the PGM is contemplating a rescue attempt. So come on, you knights of the Province of Yorkshire, North and East Riding, don your armour, mount your steed and brave the bracing winds and sea-spray of Bridlington and rescue the Gavel. Well brethren, the Gavel has been rescued but sad to say, it is STILL at Brid'. When we launched this initiative, it was with the hope that it would see the whole of the Province in short order and that it would generate interest and humerous rescue attempts. It has languished at the seaside for far too long, and whilst we are happy that it is being rescued, it really does need to get further afield, so come on brethren of the Province, get yourselves together and raid the battlements St Johns Avenue and rescue the Gavel. Disappointment reigns at Humber. We thought that the Travelling Gavel would romp all over the Province and that Lodges from Middlesbrough in the north and York in the west, not to mention those in the east of the Province would enjoy the challenge of being the proud owner, even if for only a short while, of the Travelling Gavel. Sadly, only those at Bridlington seem to have the wherewithal or stamina to make the rescue. Humber even threw down the gauntlet but it seems there were no challengers. St John of Bridlington are now the keepers until September when they meet again. Can Humber entice your Lodge to rescue it from the seaside? Perhaps the Rules are too strict and need relaxing. Four is the minimum number of rescuers but the adudicator is considering reducing this to three in the hope that this will encourage more Lodges into the fray. In the meantime, get a posy up and start planning a rescue from St John of Bridlington. Their next meeting is on Thursday 5th September - BE THERE. First my apologies for the lateness of this update but as I was in France on holiday (Avignon ) when I received notification of the Gavels rescue, I hope and trust that you will understand that the wife occasionally comes first – but not always! To business. 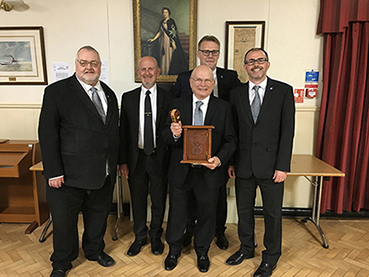 On Thursday 5th September a contingent of the very best masons from Francis Drakes 7825, descended upon the quite seaside town of Bridlington and demanded that the Master and brethren of St John of Bridlington deliver unto them the Travelling Gavel. Shocked by their temerity a battle (of words) took place but seeing that Francis Drake were adamant in their demands, the Master of St John of Bridlington handed the prize over and the Brethren of Francis Drake took their proud leave of the Lodge and galloped off into the sunset. They were last seen disappearing through city gates at York. The Lodge of Francis Drake meets at Castelgate on the first Friday of October, November and December this year (according to the Yearbook) and awaits and invites any Lodge to visit them and wrest the Gavel from their grasp. Is your Lodge capable of retaking the Travelling Gavel? It had been at the seaside for far too long but at last it has travelled inland, some would say to the spiritual home of Ancient Freemasonry, but the editor declines to enter into any historical debate about this aspect of our history, suffice it to say that the Gavel is now at the heart of our Province but still needs to travel further afield. Readers. I am pleased to announce that the Travelling Gavel has been rescued from Francis Drake of York. The Gavel has not travelled far however, because its rescuers were a contingent of brethren from Alcuin 6300, who also meet in the same building. However, your editor has received confidential information that Eboracum 1611 have set in motion a plan to raid Castlegate in April and carry off the Gavel to their home - at St Saviourgate. Is the Gavel set to travel the Province? Will the mother Lodge of our new Provincial Grand Master take up the challenge? Read our next thrilling installment. Your editor is pleased to announce that the Travelling Gavel has been rescued and is now residing in pastures new - well almost - a different Lodge but the same building! On Tuesday 13th May, five brave warriors of the Agricola Lodge 1991 descended on Alcuin 6300 (who also meet at Castlegate) and DEMANDED the unconditional surrender of the Gavel. Quaking behind their aprons, the goalers of the Gavel gave up their possession and the gallant victors rode off into the sunset - well they promptly locked it away in their own cupboards at Castlegate! Well, if you believe that you will swallow anything, but the bottom line is that the Gavel is now in the possession of Agicola and is on proud display at Castlegate, York. For those who want to take it from them, their next Lodge night is Monday 23rd June. Unlike the popular press, when a mistake is made, a correction is made, not hidden away on the sports page! I apologise to my loyal followers when I intimated that the Gavel would be rescued by Eboricum. Obviously this did not happen but I hope and anticipate that the new PGM will find the time in his busy calendar to join his brethren-in-arms and make a raid on wherever the Gavel happens to be. Watch this space!!! At the Agricola Lodge No 1991 on 22nd October, supported by 4 fellow members of the Lodge, the Worshipful Master of Humber Lodge, W.Bro. 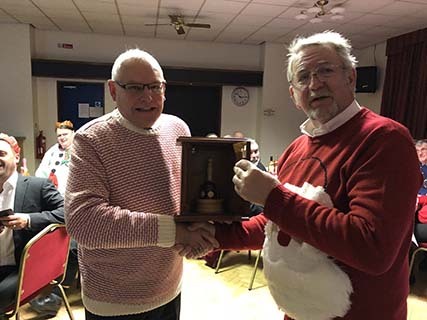 Des Hinshelwood, claimed back the Humber Lodge Travelling Gavel that had taken pride of place at their festive board since the Spring. It was an occasion with Brethren from quite a lot of different Lodges (51 visitors from 30 lodges) and may have generated a Province wide-interest in the Gavel. Certainly, the Master of Agricola expressed his intention to get his revenge. We may not have it with us for long! Apologies for the lateness of this update but your editor has been sojourning the other side of the Atlantic, visiting Toronto, San Francisco, the Napa Valley, Lake Tahoe and Yosemite. I am sure you will undertand that these places have a certain attraction over updating a website! Anyway, now back in harness. I missed the last meeting because of the above alternative activity but am assured that the night was well attended with the Londsborough lot determined to get their hands on the Gavel again, and so it transpired. The Gavel is now back at Bridlington. Brethren are invited to Bridlington to get rescue the Gavel. Lets make a valiant effort to have the Gavel travel a bit further north. What about those intrepid travellers from Middlesborough? Consider this an adventure and a cause celebre worthy of your time and effort. Can I ask our readers whether the Rules need amending with respect to the number of visitors required to demand the Gavel. When I made up the Rules I thought that four visitors was a reasonable number but now wonder whether the number was too high, thus resulting in the Gavel not travelling that far. Would three be a more attractive number? Your thought please vai the website to the Secretary. I am pleased to inform you that the TRavelling Gavel has been rescued by Hull Old Grammarians Lodge No 5129. Six members of the Lodge travelled to Bridlington where Bro. Collier demanded the Gavels surrender. Amongst the 24 visitors (which proved the value of the Gavel in encouraging visiting from across the Province) wre six members of St John's Lodge No 4434, (who have previously rescued the the Gavel), thus saving W. Bro. Ayre from having the diffuclt task of deciding which Lodge should have the honour of rescuring the Gavel. St John's diod the honouable thing and magnanimously withdrew their claim in favour of a very grateful trooup of Hull Old Grammarians. So Brethren, the story continues. Any Lodge wishing to rescue the Gavel needs to now travel to Hull and the magnificent Masonic Hall at Dagger Lane. This was a glorious day, the moon setting and the sun rising from its slumber when six galant knights of the Order of St Cuthberts 630, in the Masonic Province of Howdenshire, and the historic township of Howden took a circutous route to the principle city in the area and surprised the members of Hull Old Grammarians, the stout defenders of the Travelling Gavel and demanded the surrender of their prize - not a pint of John Smiths but the Travelling Gavel. As our readers can see, the Knights of St Cuthberts were successful. Perhaps others in the Province would care to try and get it out of St Cuthbert's possession. All you need to do is get four of your members and visit the Lodge and make your demands. Beware however, other Lodges may also decide to do the same and arrive with more than the required number. Your editor will keep you apprised of developments. Only a week into the new year and the Travelling Gavel is on the move again, this time back to Hull. After several failed attempts to gather sufficient brethren on previous occasions, a steely determination set in when De La Pole 1605 heard that the Travelling Gavel was imprisoned at Howden and gaurded by the St Cuthberts crowd! Not taking any undue risks of being out-gunned, seven brethren from De La Pole, lead by their Worshipful Master, David Atkine, descended on a bright moonlit evening to the quite market town of Howden to cause mayhem and destruction, if necessary. 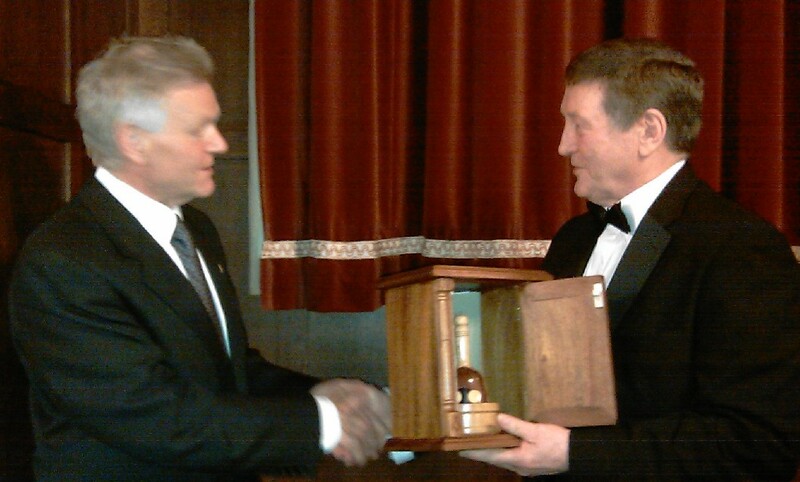 Fortunately neither was required and the Gavel was handed over peaceably, as can be seen from the photo below. Well done De La Pole led by their gallant Master. So readers, the story continues. Read our next thrilling episode, but only after the famous Travelling Gavel makes a bid for freedom, aided by a Lodge in our Province. Will it be yours? The historians in our ranks will know the significance of this date, Friday 13th, albeit not in June, but nonetheless, still considered unlucky. And so it was for De La Pole, who were unlucky in that a strong contingent from Constitutional Lodge 294, decided, for once, to venture out of the safety of Beverley and travel abroad on a cold and misty night to the Masonic Hall, on Beverley Road, Hull and there persuade the Master, David Atkine to relinquish the prized possession, which with some reluctance, he did. So readers, the Travelling Gavel has found a newer home at Trinity Lane, Beverley, were it is hoped it will only be in residence for a short time. Is your Lodge and members prepared to rescue the Gavel? Watch this space. Dear readers, can I first aplogise for the delay in posting this update. I was informed that it had passed on to another Lodge but did niot get round to updating you all until now! I will endeavour not to keep you in suspense again - promise!!! Anyway, back to our story. Friday 13th stood up to its reputation for bad luck for on that unlucky day, De la Pole 1605, which Lodge had successfully taken possession of the Travelling Gavel on another Friday 13th (February) lost possession to one of the oldest Lodges in the Province. On this day Constitution 294 made a surprise visit to the secure confines Beverely Road, whereupon they demanded thatb the Gavel be handed over. This was duly done and now resides at Trinity Lane, Beverley. 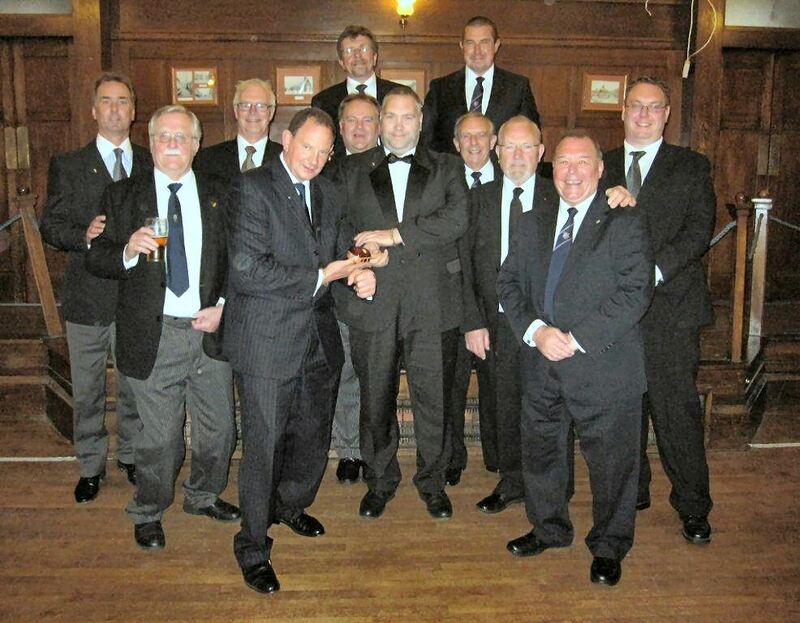 On Saturday 9th May the annual Provincial Grand Chapter and Lodge met at the Central Hall, University of York. Unfortunately your editor could not be present but is given to understand that it was a magnificent day, especially as both Provincial Grand Chapter and Provincial Grand Lodge were meeting on the same day, back-to-back. 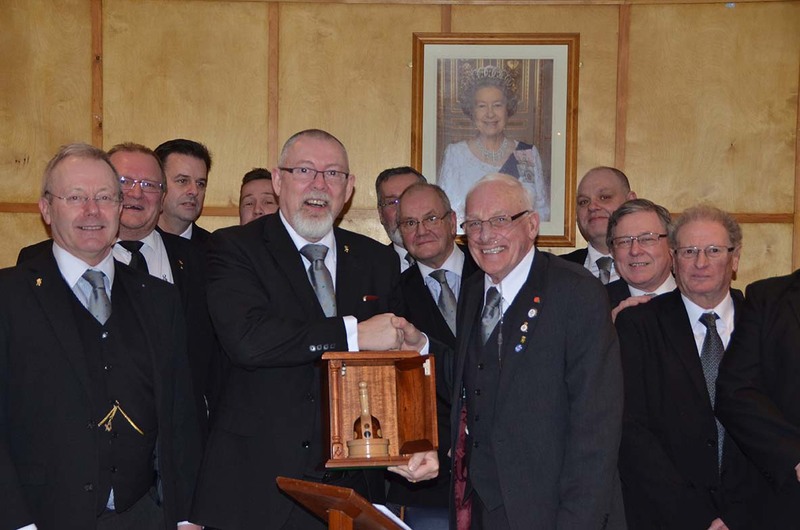 What also made it special was the intention for the Travelling Gavel to be presented to the Provincial Grand Master by the current holders, Constitution 294. Unfortunately, the earlier meeting had overrun slightly, which impaced on the Festive Board, which resulted in the Gavel not being presented, as hoped. It is anticipated however, that next year our Provincial Grand Master will be presented with the prize. So Brethen of the Province of Yorkshire, North and East Riding, get your thinking caps on, and plan that raid and rescue the Travelling Gavel. If you time it right, you may just have possession of it at next years Provincial Grand Lodge meeting. Brethren, I have just been advised that the Travelling Gavel has once again been rescued. On Thursday 4th June, four members of the St Cuthbert's Lodge 630 travellend over the Wolds to Trinity Lane, Beverley. Although it was not a full moon, the four sturdy travellers set forth and successfully retrieved the Gavel and with a whoopee of triumph they made a quick escape from the bewildered brethren of Constitution. The legendary Gavel now sits in pride of place at Howden Masonic Hall awaiting rescue from any Lodge in the Provinve brave enough to attempt a rescue. Will that Lodge be yours, I wonder? om followed by a Festive board of Good food, Fun & Fellowship. Pictured is the WM of St Cuthberts Matt Dalby presenting the Gavel to Hymerians Class of 2015. An enjoyable evening was had by all at Old Hymerians Lodge when eleven Knights of the Riding Tablers Lodge decided to visit and witness a 1st Degeree ceremony, which your editor is informed was very well executed. The Festive Board was equally memorable for the candidate, and the brethren of the host Lodge when the Senior Warden, acting on behalf of the Worshipful Master, who had been under strict instructions from his wife to take her on a cruise, demanded possession of the T ravelling Gavel. Reluctantly, W. Bro. Cadle handed the prize over and the rest of the evening was taken over by mirth and good humour. This is what Freemasonry is about and I am sure that the new candidate to the Order will remember the evening, well perhaps not all of it, but that part of the evening which brought so many Freemasons together. 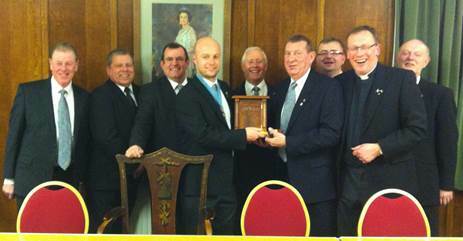 Riding Tablers' Lodge managed to hold onto the Travelling Gavel for the best part of two months - congratulations. However, on Friday 27th November their guard was obvioulsy down, probably concentrating on the installation of the new Master, Steve Hastings, because Wilberforce 2134 took full advantage by surrounding the new Master and his warriers with ten Knights from that worthy Lodge. W. Bro. Hastings, almost certainly overwhelmed with emotion having just been installed into the Chair of King Solomon, handed the Gavel over and the new guardians went merriliy on their way. The Gavel has however, not travelled too far, and is still in the same building at Beverley. This is a Festive Challenge. The Travelling Gavel has never been north of Filey, so in an effort to entice Lodges to venture south, your editor is offering to buy all of the visitors a festive drink if they attempt and succeed in rescuting the Gavel and take it north of Filey. This challenge is open until 31st January 2016 to all Lodges in the Province north of Filey. Apologies to those Lodges below that line!! In the meantime, Seasons Greetings to all our readers, wishing you and your family the very best for Christmas and the New Year. Eight members of the Technical Lodge No 5666 made a surprise visit, (well not really but it makes for a better story) toWilberforce Lodge 2134 on Tuesday 12th January and were successful in seizing the Travelling Gavel. The raid was fronted by that gallant knight W. Bro. Mike Cheeseman the Worshipful Master, who was supported by Bros: Rob Atkinson, Danny Laughton, Mark Cusack, Ian Parkinson, Alan Large, Tony Moore and W.Bro. Frank Lovely. Well done. The Gavel has now taken pride-of-place at Technical's headquarters, Beverley Road, Hull and those brave enough to visit will find a warm welcome. Saturday 16th January saw a contingent of Brough members make a consolidated attack on Technical when they successfully took possession of the TRavelling Gavel. The trophy has now taken pride-of-place at the Brough Lodge, Sutton and awaits attemps by fellow masons to try and get it back. 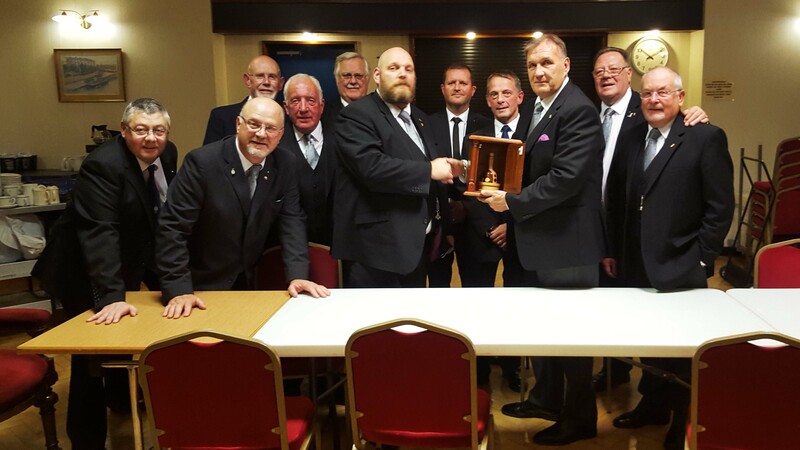 Humber 57 took up the challenge when 10 worhty knights decended on the sleepy hollow of Sutton-upon-Hull and caused mayhem and carnage (metaphorically speaking) and wrestled the Gavel from the good brethren of Brough Lodge. A great night was had by all with many references to the excess number of Humber brethren it took to acquire the trophy, when four would have been enough! Bro. Hatfield was the main cause of the verbal abuse, which will be reciprocated when he next visits Humber at Dagger Lane. In the meantime, is there any Lodge in the Province who would dare to take the Gavel from the originators? Remember, last year it was announced that the Provincial Grand Master had agreed to receive the Gavel at the Provincial Grand Lodge meeting. Sadly, this did not happen last year almost certainly because last year was the first time that Provincial Grand Chapter and Lodge had met on the same day and there was insufficient time to make the presentation. Hopefully, this year enough time will be available. So, on Saturday 30th April the Lodge having possession of the Gavel will be expected to present it to the Provincial Grand Master. Will this be your Lodge? Three days. Three days is all we had with our prized possession before another Lodge came along and grabbed it. We hadn't even chance to give it a good clean! A great night on Tuesday when we had an initiation and several Lodges came along to watch the new candidate take his obligation. Amongst those attending were five from Brough and five from St Michael. Of course we all suspected that the Brough lot, led by Martin Rowan had decided to visit and retrieve the Gavel from whom we had taken it off the previous Friday. That turned out not to be case, but seeing the way open for an attack, St Michael, led by their IPM, Allan Allinson took up the challenge and walked away with the trophy. So you lot out there. The Travelling Gavel is waiting to be rescued and is anxious to travel further afield. Will any Lodge north of Brid' like to display this worhty artifact? 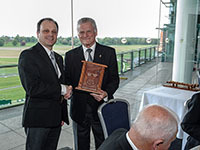 Don't forget Saturday 30th April when Provincial Grand Chapter and Provincial GRand Lodge meet at York University whern it is hoped that the current holders of the Gavel will present it to the Provincial Grand Master. Will that be your Lodge I wonder? On a hot a sticky night, on Thursday the 23rd of June, 7 fearless brethren from the Lodge of St Andrew (4683) went on a carefully planned and executed raid behind enemy lines to relieve the Lodge of St Michael of the Travelling Gavel. 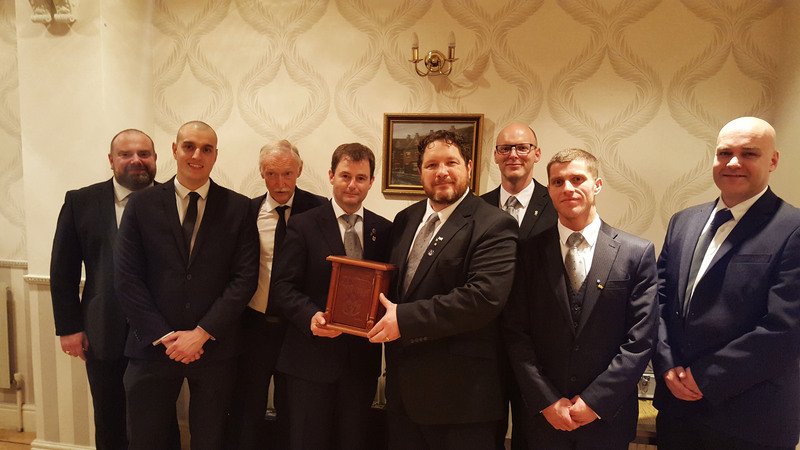 The brethren set their ambush and waited patiently in the darkened wings to witness a fantastic 1st degree ceremony performed by W Bro Antonio Ramirez and his new Officers after which they finally executed their attack to demand the Gavel, before tactically withdrawing back into the night. The Lodge of St Andrew have already bolstered their security at their base in Beverley Road, Hull for the expected counter raid. We will be ready… . Pictured L-R Bro. Mike Heseltine, Bro. Matt Owen, Bro. Ian Montgomery, W. Bro. Antonio Ramirez (Lodge of St Michael), W. Bro. Paul Bull, Bro. Craig Dalton, Bro. Eddie Brook and Bro. Daryl Roberts. The Gavel had previously been rescued by Minerva 250 but regrettably the Editor has no details of the rescue so this episode is presently missing, but if someone has the details we will be happy to make the amendments. Installation night at Humber started really well. Lots of guests, W. Bro. Chris Thomas representing the PGM, Ian Syddall mumbling to himself and pacing up and down whilst Craig Maurier looked a peaceful. What a difference! Anyway, Ian managed to get through the ceremony without a hitch – not too sure why he was nervous to start with, there really was no need. The Festive Board was full of fun and cheer and it is fair to say that all had a jolly good night. The toasts were short and to the point – always welcome after a long night. Thesaurus had indicated that they would make a bid for the Traveling Gavel, and so it came to pass with Mike East taking possession of the prize before the Parting Toast. A Great night, good company and the Gavel passing on to another worthy Lodge. A quite night, at least that was how it started. Thesaurus, having taken possession of the Traveling Gavel the month earlier perhaps did not expect to lose it so quickly but they did not take into account the resourcefulness of Technical 5666. They approached the task with precision and having researched the problem put their best team to the task. As can be seen Mike East has a forced smile on his face as he hands the Gavel over to James Steele who carried it off to their castle on Beverley Road, Hull. The Gavel is getting some attention. Who will be the next to hold the prize aloft? Secretaries, watch out for an Email from Province regarding the Traveling Gavel. I am not at liberty to say too much at the moment, but the Gavel is getting a real push. So, watch your InBox and start planning! More to follow. Thesaurus Lodge managed to hold on to the famous Gavel for a total of nine days before knights from St Andrews Lodge 4683 persuaded W. Bro. Steele to hand it over. As can be seen in the photo, he was a little reluctant to comply with the request. However, through diligent negotiations, he was eventually convinced that handing it over was the correct and safest course of action. So brethren, who will be the next Lodge to take possession of the Travelling Gavel. The race is on to see who will have it in May! There is no prize for guessing what May will bring, but Secretaries, watch your Inbox. The Editor. On a fair night, not too chilly - just right, St Andrews Lodge 4683 welcomed 14 visitors from a number of Lodges in the area. A great night was had by all, but W. Bro. 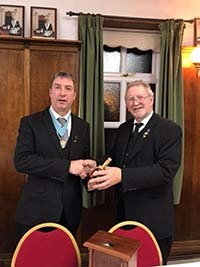 Ellwood of the Ridings Tablers' Lodge 9586, together with three of his companians demanded that the Gavel be handed over. Your editor was on other Masonic business at Hornsea when this demand was made so am unable to report the exact details of what was said - perhaps it just as well as this is a family read column! Suffice to say that the Ridings Tablers' rode away happy. Why not get your WM and brethren to visit Ridings Tablers' on Friday 24th March and demand the Gavel. The Provincial Grand Master will be in attendance that nighht, so why not come along, support the Lodge, the PGM, and take the Gavel? Can I first apologise to all our followers for not updating the site. In my haste to 'get away' it is regrettable that I forgot to bring you all up-to-date with the whereabouts of the Gavel. I am presently sat in a hotel room in Pamplona, Spain, having driven down from our cottage near Chateubriant on our way see our daughter and husband who have relocated to the Spanish Riviera, when it suddenly dawned on me that some gallant Lodge maybe wondering what had happened. Friday 24th March started as a bright and cheerful day with the birds singing and a slight chill in the air - just right to swoop in Ridings Tablers' and take possession of the Gavel. The PGM was also in attendance together with a goodly crew to support him. As you probably know he had only the week before had a new knee fitted but already he was out and about, without support, other than the moral kind. I know that we all wish him a speedy recovery. Anyway, back to the Gavel, several of us arrived at Trinity Lane and listened to a very interesting 'Talking Heads'. If you have not heard the presentation, then you should make the effort. At the end of the evening, W. Bro. Whitfield stood and demanded the Gavel, which was met with some dismay from the Ridings members. As a Founding Member of Ridings Tablers, I am also a member of Humber (my Mother Lodge) and many looked towards me mentally asking if I was in the Humber or Ridings camp. As I had stood with the Humber brethren, I had nailed my colours to the mast and I got some ribbing later in the evening when I was tasked with collecting Gavel from the Master. You can, I am sure appreciated that there was some waggish commernts about my loyalty and whether I had signed in as a Humber or Ridings member. Needless to say that it was all taken in good spirit and brotherhood prevailed. 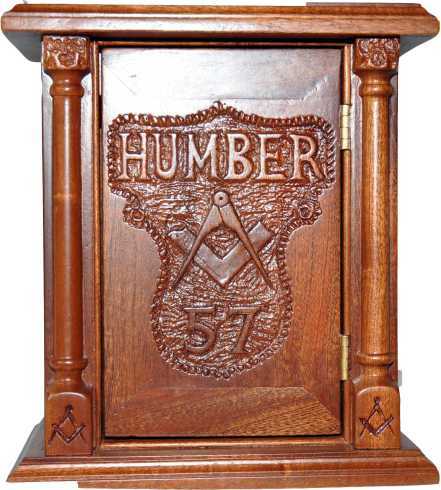 Humber 57 now have the Gavel, if any Lodge wishes to try and secure it. First of all my sincere apologies for the lateness of this update. I have no excuse other than taking advantage of the glorious weather. For those of you who have been reading the recent editions, you may by know, especially if you attended the Annual Provincial meeting on the 13th May, that the Traveling Gavel has taken a giant leap forward. For the past few years we have been trying to get the Gavel as part of the Provincial meeting but because of unforeseen circumstances, lack of time, and changes of venue etc, it has not been possible. But this year the Gavel made it and what a splendid occasion it was. 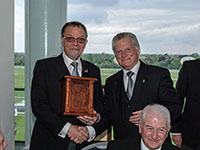 At York Racecourse, hundreds of Freemasons all enjoying a great day out at both the Chapter and Craft, meeting old acquaintances and making new friends and then retiring to the Festive Board in between, at which the Gavel made its appearance. What made it even better, and added to the suspence was an idea of the PGM, and what had been hinted at by your editor, but without giving the game away. The Gavel was presented to R.W. Bro. Gillyon at the commencement of the Festive Board by W. Bro. Craig Maurier, the WM of Humber 57, who just happended to be in possession of the Gavel at the time. Some would generously say it was just luck, whilst others may suspect foul play! You may think that, but your editor could not possible comment. At the end of the meal, and after Grace, the PGM then announced that the Gavel would be presented to the Lodge who had the most diners. Drum roll...............................The PGM then announced that two Lodges had large numbers of diners and he named them (the Lodge, not the brethren) before proclaiming that Wilberforce 2134, with 18 brethren were the winners and their WM, W. Bro. McKee took possession of the Gavel. He was last seen galloping away on a dapple grey filly!!! Didn't get her name but she was considered a rank outsider. Well brethren, the secret is now out and we hope that the Gavel will make another appearance at next years Provincial meeting, but in the meantime, all brethren are invited to try their hand at rescuing the trophy. Brethren, the Traveling Gavel has moved on - back to Humber. A splendid night was had by all who attended the regular meeting of Wilberforce, with two Lodges vying for prominence to secure the Gavel. 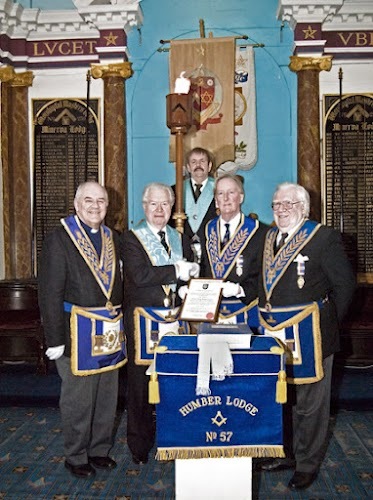 Humber had intended to make a bid but another Lodge, who shall remain nameless also attended and had made it known to Humber brethren, that they would also like to challenge for the prize. The rules make it clear that Lodges have to declare their intentions at the meeting. The rules also stipulate that if a Lodge has previously held the Gavel in the previouos 12 months and another Lodges makes a bid, that Lodge will be declared the rescuing Lodge. Sadly, the un-named Lodge failed to declare and therefore the Gavel was rescued by Humber. So brethren, the rules are clear and almost any Lodge can claim the prize and it would be great if a Lodge from north of the Province would make an attempt. Why not book your place at the next Humber meeting, which is on Tuesday 8th August. You can witness our Fellowcraft brother taking the next step in the Masonic journey, and make claim to the Gavel. Come on, will you take up the chellenge? 5 members of St Cuthberts 630 made the arduous journey across the Wolds and down Castle Street in the City of Culture where they were warlmy welcomed by Humber brethren. A fine Raising ceremony was witnessed and a most enjoyable Festive Board was partaken of by all, at which time W. Bro. Des Ashton demanded that the Travelling Gavel be surrendered to his custody. W. Bro. Craig Maurier, felt duty bound to hand it over. The capture of the Gavel was a coincidence of the fact that Humber 57 had recovered the Gavel from Wilberforce only a few weeks earlier. The St Cuthberts crew was last seen bounding down Castel Street on their was back to Howden. How long will St Cuthberts hold the Gavel? This is a challenge to all Lodges in the Province. Try your luck. It has been a little while since the location of the Travelling Gavel has been publicised, but we now know where it has been and when. St Cuthbert's meet on the Thursday before a full moon and without having been told of the actual date of recsue, your editor took a stab in the dak (actually it was during the night when the moon was full!!) Anyway, on or abour 16th November 2017 a group of gentlement from the Lodge of St Andrew took the perilous journey from the safe haven of Hull across the wolds to those dangerous and infrequented outlands known as Howdenshire. There they were warmly greeted by members of St Cuthbert's, who after a very cordial evening relinquished the trophy. A great night was had by all, and fortunately, all the brethren from Hull returned unscathed from their adventure. 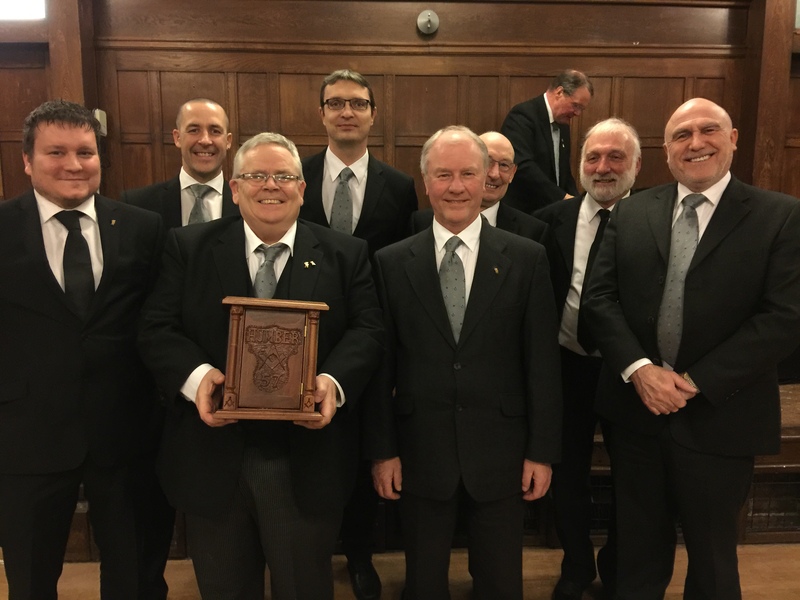 Wednesday 13th December was a cold and wet night when eight members of the Old Hymerian Lodge attended the St Andrews lodge in a surprise swoop. Worshipful brothers Anthony Cadle, who organised the venture, was accommpanied by David Cadle, Rodger Thorpe and Alex McCullen, brothers Roy Holborn, Andy Crozier, Bryn Abbot and Peter Presland. The brethren requested to make their intention plain at the ceremony proceeding the festive board, so in the absence of the Worshipfull Master and as Senior Warden Bro. 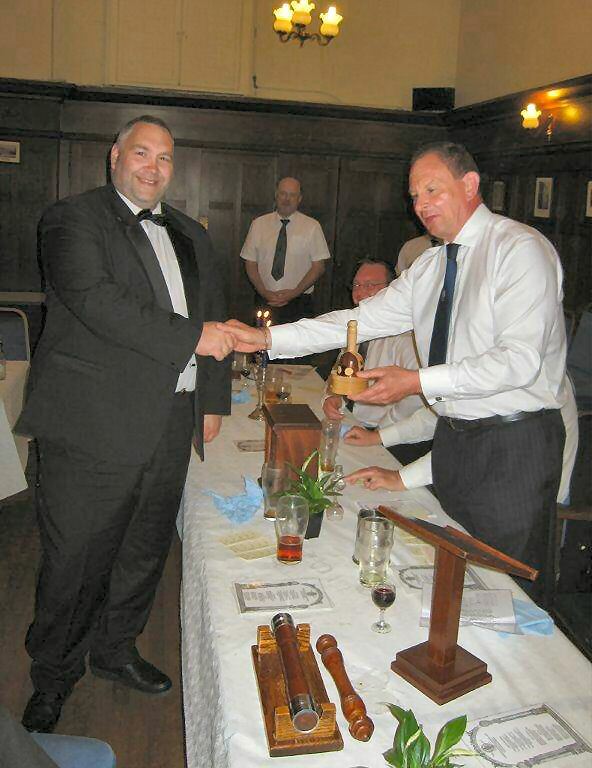 Holborn gave greetings to the Worshipfull Master and stated their intention of claiming the Travelling Gavel. 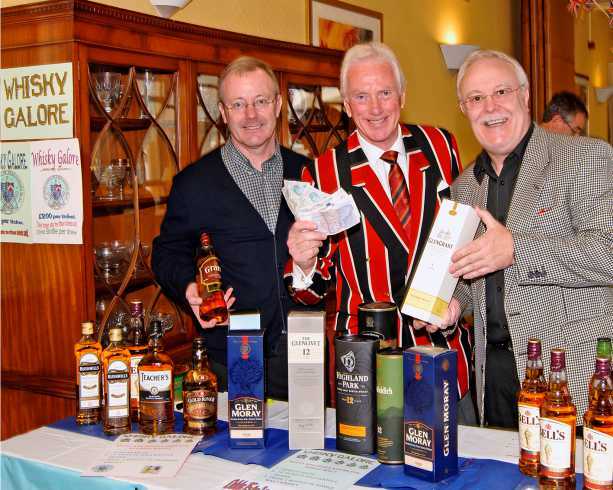 The Lodge of St Andrews had requested we stated our intention in the lodge so that it would be entered in the minutes. The festive board unknown to us (as we were not given a summons), was a Christmas ladies evening and Christmas jumpers was the norm . They really made us wait to receive the Travelling Gavel, it was a very long evening and it was not intill the very end that they presented the Gavel to me as the Senior officer , an undertaking I was proud to do. 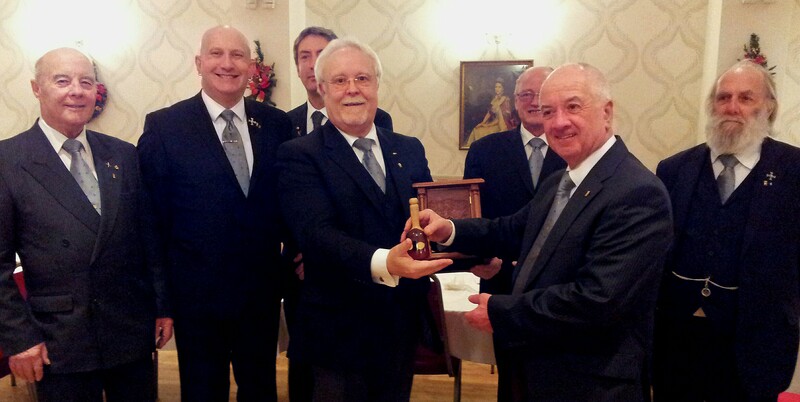 I was even prouder to present the Travelling Gavel to our lodge on the following evening at our Christmas festive board. A truly enjoyable evening had by all. As the Senior Warden of Old Hymerian, I hereby throw down the gauntlet. Come a rescue the Gavel if you dare. Roy Holborn. Welcome followers. It seems a long time since this page was updated, and so it is. You will see from the above that Old Hymerian kept a firm hold of the Gavel for some months and was only rescued by the Lodge of St Andrews 4683 in early April. I have no details of the rescue. Can I take this opportunity of remindiung brethren of the reason the Gavel was first conceived? It was to encourage visits between Lodge, and to a large extent it has acheived that goal but the Lodge in the north of the Province seem reluctant to travel south, perhaps they are afriad? I suspect not but if a dig will get them further south than the the North York Moors then I will take any flak. Also, do not forget that the holder of the Gavel is expected to present it to the PGM at the Annual Provincial Meeting in May. If that is not an incentive then I don't know what is! It seems that the Lodge of St Andrews could not hold on to the Gavel too long because it was rescued by Andrew Marvel 5642 only four days after they acquired it from Old Hymerians. 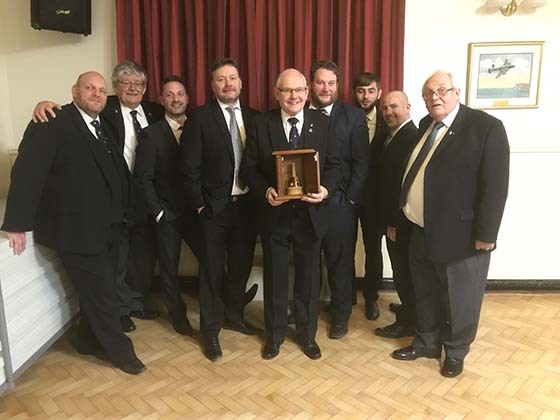 Perhaps the lure of presenting it to the PGM at the Annual Provincial meeting that weekend prompted them to try their luck, and they succeeded. Here they are, in all their splendure holding fast to the Gavel. They (L - R) W. Bro. John Towler, Bro. Stephen Falkinder, W. Bro. Andrew Peach (WM), Bro. Ian Dixon and Bro. Andrew Parker. Well brethren, I beleive it was presented to the PGM and he duly passed it on to the Lodge who had the most attending the meeting. I will await formal notification and photo evidence before publishing their names. Isn't it about time one of the Lodges in the north of the Province ventured south to take this prized possession?